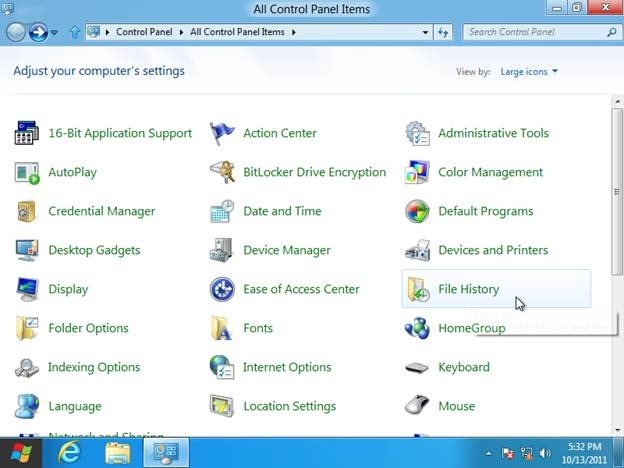 Here is a short step-by-step tutorial for How to back up file history in Windows 8. 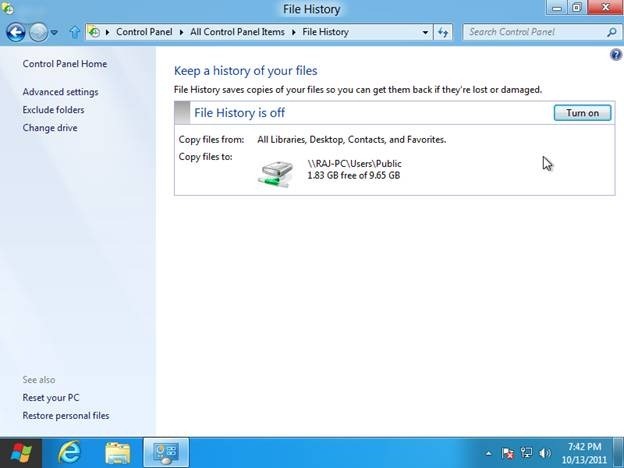 Microsoft has added a large number of new features in Windows 8 but one of my personal favorites is File History Back Up feature. This feature allows you to restore the User Profile folders, by saving them to various external devices (a removable device or a network device or to a hard disk partition with some settings). And to add to its functionality, it keeps track of various file versions so that you can easily single out and restore the one you want, directly to its original location. Click the “control panel” tile on the Metro UI desktop.The control panel will open. Navigate to the bottom of the list and click “More settings”. Window 7 style control panel will open. Click “File History”. Now attach an external device(like your usb pen drive) or specify a network location where you want to back up your files. Click “turn on” button to start file history backup feature. Now your file history feature is on. By default your files will be backed up after every one hour. You can change this frequency by clicking on “Advanced Settings” and then selecting the desired frequency. Also check out other Windows 8 features reviewed by us.